Step 1Add the diced beef to the slow cooker container. (Chop beforehand if it's not pre-chopped). Step 2Add the carrots, onions, and mushrooms on top of the beef and mix together. Step 3Add the tins of tomatoes to the blender. Step 4Blend in the ginger, garlic, ground pepper, cumin and beef stock cubes. Step 5Pour the sauce over the other ingredients. Step 6Turn the slow cooker on to medium or high. Step 7Cook for 6-8 hours. Step 8Let the stew cool slightly before adding 100g of cornflour to thicken it. 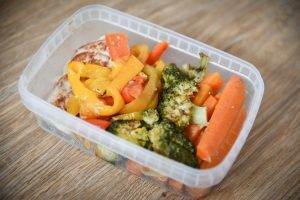 Cooking in bulk is a great way to have meals ready when you don't have time or are feeling too lazy to cook. 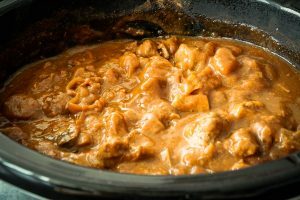 Using a slow cooker is also great as you can just leave the meal to cook away while you are at work, sleeping or doing other things. 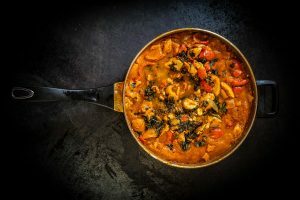 This stew is a classic healthy recipe containing a good portion of vegetables (carrots, mushrooms, and onions), in a spicy tomato based sauce. The ingredients I've used make 10 portions, each containing 282 Calories and packing in 37g of protein, 20g of carbs and just 6 grams of fat. After preparing the ingredients, you just need to leave it to do its thing in the slow cooker! Best served with rice or potatoes with a side of green veg. 50g of uncooked rice adds 158 Calories. If you divide the servings into 11, the calories drop to 260 and you still get 30g of protein per portion. 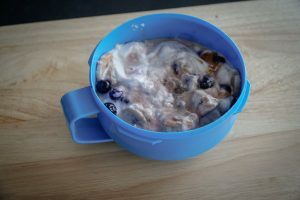 When storing in the fridge or freezer, you can use plastic Tupperware containers. In the video, I weighed the slow cooker container. However, if your scales only support 5kg rather than 10kg, you may need to transfer it to a lighter container to weigh the stew before dividing it into portions. Remember to zero the scales after you put the bowl on them.